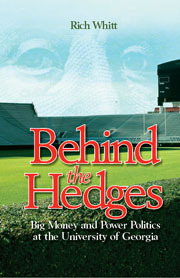 The Peach County, Georgia Leader-Tribune joins a number of news outlets still talking about reporter Rich Whitt’s controversial book Behind the Hedges: Big Money and Power Politics at the University of Georgia. News Editor Victor Kulkosky felt so incensed by the revelations in Behind the Hedges of the behind-the-scenes politicking at the University of Georgia that he devoted three of his “Out of My Mind” columns to the book. Read Victor Kulkosky’s May 13, May 20, and May 27 columns about Behind the Hedges. You are currently browsing the archives for the Behind the Hedges category.